Since I started my teaching career at a low-income, inner city school, I’ve been on a journey to understand my own privilege. I’m a white, middle-class Christian in a place and time when that identity confers benefits on me that I didn’t need to work for. It’s not my fault, per se, but then again this isn’t about blame: it’s about educating myself, making the inequities transparent, and being purposeful about correcting them. It’s not my fault the system is flawed, but if I ignore it and continue to profit from it, I’m complicit. That doesn’t sit well with me. This is just a teeny tiny example of a privilege I have on a daily basis. I try to correct for this by making sure voices of different races, genders, religions, ethnicities, and classes are heard in my classroom, so that my students see the broad range of human identity. Peggy McIntosh wrote the iconic and extremely useful piece, White Privilege: Unpacking the Invisible Knapsack, to tease out more privileges she experienced. Privileges vary widely; you might not experience the same ones as McIntosh for a lot of reasons. Your identities may be different than hers (for instance, you might not share her race, gender, ability level, religion, class, sexual orientation, location.) It’s also been 20 years since the article was written, so doubtless things have shifted a bit. Nevertheless, the article is a great model for self-reflection about what privileges we enjoy without realizing that they aren’t extended to everyone. I decided to share these thoughts with you, of course, because of the shooting and the subsequent media portrayal of unarmed Michael Brown in Ferguson, Missouri. The dramatic conflicts online in the wake of the shooting brought back memories from diversity training before I started teaching. Hundreds of newb teachers — most of us white, most of us middle- or upper-class — gathered in an auditorium to screen the film Last Chance for Eden, where 9 folks from different walks of life engage in an authentic conversation about race. I still remember the reflexive defensiveness in the voices of those who spoke out after the movie. One person asserted, “I didn’t own slaves or restrict rights. I don’t understand how it’s my fault. I feel blamed. I don’t deserve to feel guilty.” His last sentence was so telling: I don’t deserve to feel guilty. He did feel guilty. And it created a visceral indignation that he immediately sought to justify. Why should he have to bear that guilt? Why should he feel hurt and uncomfortable thinking about those people’s experiences if he didn’t cause them? It wasn’t fair! What he didn’t realize is the guilt didn’t come from anyone blaming him for creating racism. It came from someone pointing out how he still benefits from it unconsciously in his every day life. From pointing out privilege. And no one did that just to hurt his feelings or to call him bad. They did that to make it transparent for him so that he can move through the world in a conscious way. White folks, when we realize we are benefitting from privilege, we have two choices. We can fight as if someone is blaming us: “Well, it’s not my fault! I didn’t do anything wrong!” Or we can lay down our defensiveness and say, “I want to learn more. If I see places where I’m safer or treated better because of my skin color, I’m going to work to end that.” Because while we’re busy saying, “It’s not my fault! I don’t deserve to feel bad for this! I didn’t do it,” parents are teaching their kids how to avoid being shot by police. Protestors are marching with their hands up. A friend from church is relating how she was stopped and followed into her home by police officers for no reason. We need to set aside the discomfort of knowing we benefit from a flawed system and start caring about other people’s much more serious discomfort. Where are my white people? That’s a lot to process, so I’ll offer you some cake as well. This is the perfect cake for those of you out there who don’t like to bake, who are too lazy to bake right now, or who like to bake but also like icebox cakes. 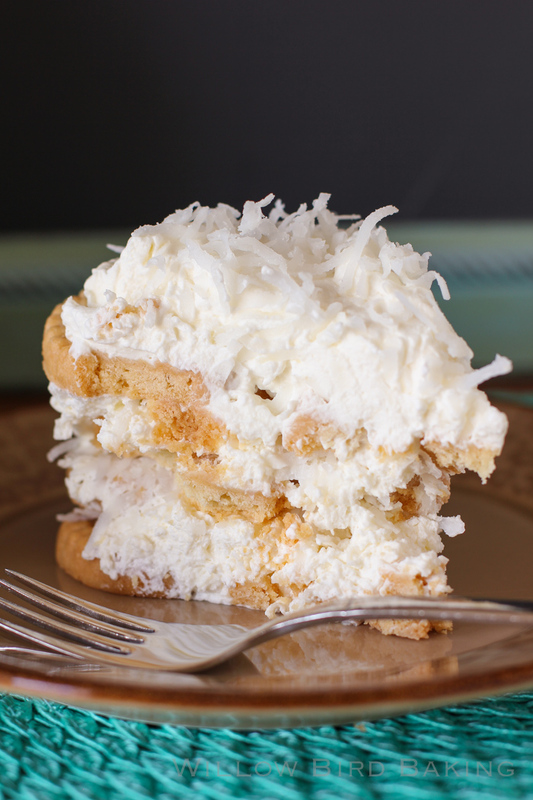 This No-Bake Coconut Icebox Cake tastes just like a decadent, buttery, fluffy coconut cake without any of the work. The only hard part is waiting for it to chill overnight, but you can do it! I believe in you. Enjoy! 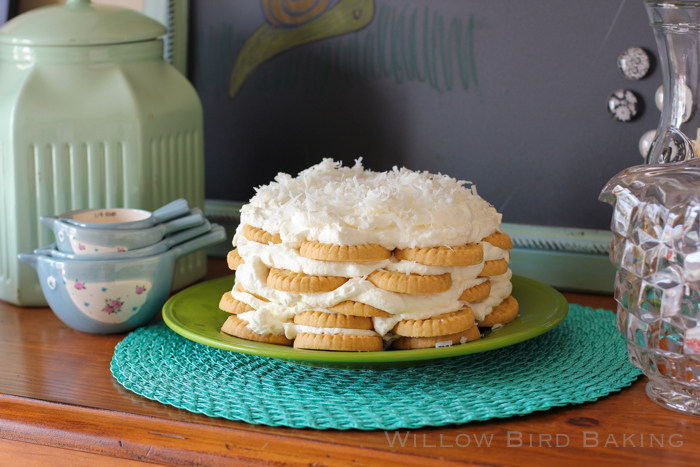 Finally: the easiest ever coconut cake! It’s a coconut cake for the masses. Too lazy to bake? Too hot to bake? Too busy to bake? 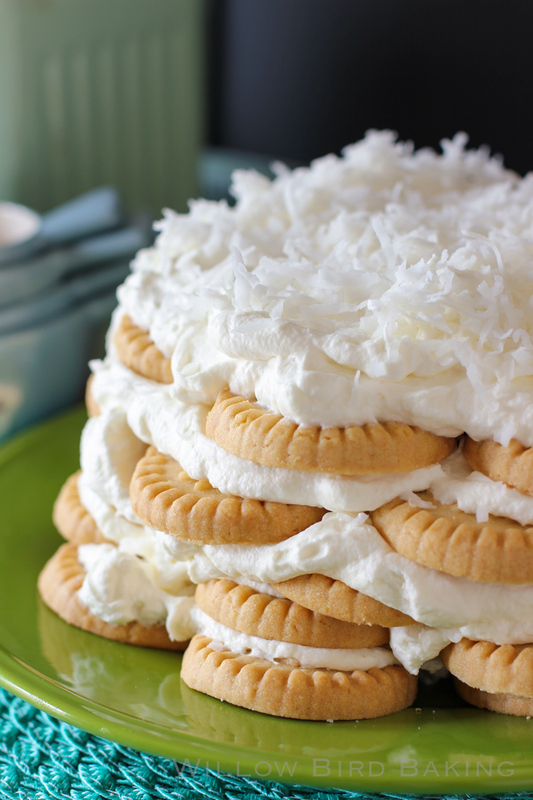 This is your coconut cake. Lucky you, because it’s also totally insanely delicious. Just be sure to buy really good shortbread cookies. Enjoy! *In some cans, coconut milk separates into solids and liquids. If it does in yours, just use the solids. If it’s more homogenized, though, that’s okay — just use it as-is. Beat together cream, powdered sugar, extracts, and coconut milk in a chilled bowl until the mixture develops stiff peaks. Arrange one box of cookies on a plate as the first layer of your “cake” — I was able to create a circle with 2 cookies in the center. Dollop about 1/5 of the whipped cream mixture on top, spreading it gently to the edges of the cookies with the back of a spoon or an offset spatula. Sprinkle about 1/5 of the coconut. Arrange another box of cookies on top of this filling. Continue alternating cookies/filling until you finish with filling on top. Sprinkle on coconut. Refrigerate overnight before serving by cutting with a sharp knife into cake slices. Oh, Julie. Thank you so much for writing this! We need more words like this out there. We have to seek to end it. Well. this look absolutely beautiful AND tasty! Oh you’re absolutely right. A lot of people don’t realize the privilege they may have without having to live in someone else’s shoes, so to speak. Too bad you couldn’t solve the world’s problems with this cake, right? I’m unclear on your point. The few of these that I googled were all murders that were investigated and where the suspect was put on trial OR where the suspect was actively being sought. In Brown’s case, they know where the suspect is. They just haven’t done anything about it. The police officer has not been indicted for wrongdoing; indeed, plenty of people seem to feel the killing was justified even without a trial being completed and with no facts to indicate that that is the case. Same issue for someone like Trayvon Martin: plenty of people argued that there was reasonable cause for the unarmed kid to be murdered. When murders happen and everyone agrees that they’re murders and the suspect is put on trial, I’m not sure why there would be national news or protest. White on black, black on white, white on white, and black on black violence happens every day without making the national news. But when a murder occurs by law enforcement and people then begin defaming the victim’s character and arguing that it was justified (for apparently no reason other than… they think so? they implicitly trust police? they think shoplifters deserve to die? I don’t really even know) we really need to analyze ourselves. There are natural repercussions in the community (and hopefully in our hearts, though not if we hang on to defensiveness) that are newsworthy. Shoplifters do not deserve to die, of course. However, a police officer has a right to defend himself if the suspect does not behave as told, i.e. in a threatening way. And according to the statistics, black males on average are more threatening. I disagree that an officer may use deadly force if a suspect does not do what they’re told. However, you’re right that in a life-threatening situation (e.g. when confronted with a deadly weapon), they can. This is precisely why folks want a swift investigation, indictment, and trial, Irene. Right now there appears to be no evidence that the officer’s life was threatened; however, naturally he is innocent until proven guilty. Unfortunately, there has been quite a delay in indicting/arresting him. I hope it’s resolved soon. Unfortunately, black people seem to continually be killed in “self-defense” sort of situations when they are not armed or on the offense. For instance, in 2 recent cases, a black person seeking help after a car crash was assumed to be dangerous and was killed (once by police, once by a homeowner.) I think we must ask ourselves where the assumption that a black person is “more threatening” is coming from and what really justifies the use of deadly force. Should we be able to kill someone because we’re scared of them? Particularly for a police officer, I would think the burden of justifying lethal force would need to be very high. Also, just so you both know: it’s okay with me if we’re on different places on this. I really value discussions. I just ask that we all come to them with open hearts and minds and ready to listen to one another. People always say no one changes anyone else’s opinions on the internet, but I’ve had the opposite experience: when talking with people who lay down their preconceptions and reflex to defend themselves and their ideas, I’ve changed my mind on things and others have changed theirs. It can be really productive. So thanks for making sure that happens so far on this thread! Irene, could you post those statistics? I have never heard of such. Or is that just another way for media to brainwash individuals into believing that black males deserve every injustice served to them? This articles include very telling statistics, Kimberley: When Youthful Mistakes Turn Deadly. Stunning words, dear Julie. It is incredibly heartening to read this right now, at a time when I — this country — needs it so desperately. You are right on and I am deeply grateful for your voice. So brave of you to write about this on your page. And it’s clear by a comment or two above that there is still such a defensiveness to the white race. “well, black males are more threatening.” OUCH. So far to go yet…. i agree…i myself could not believe the “black males are more threatening” line. wow. on average, white and black people commit crimes at the same rate, and yet “black people are more threatening” and the prison population is overwhelmingly black. That gave me pause too. Thanks, Aimee. Thought provoking, and current (unfortunately, it always seems to be current…), but not ALL about political views. I came to believe awhile ago that it’s not the color of a person’s skin that is more or less frightening. It’s their set of values that differ radically from our own. It’s easy to understand people just like you…who grew up in an environment similar to how you were raised…not so easy where you have no point of reference to identify with them or their values that were taught or not. Its not always blacks who are discriminated against. It all depends on the area of the country you reside in. In some locations it’s, Cubans, Mexicans, native Americans , etc… What about reverse discrimination that tries to right the wrong…that’s another whole form of discrimination with consequences. In the end it’s a complex issue that is not solved by rioting and looting. Sometimes our decisions end up producing unintended consequences or circumstances which can be harmful or fatal. As for Woody Allen, I’m not defending him because he obviously has issues, but most people write or produce what they are familiar with so why would he write about or direct movies about something he is not familiar with. Rather than responding individually to your points, I’d like to take a step back and ask: why is it so important to you to make the point that people besides black people can be victimized? Is your point somehow that racism doesn’t exist, and that people discriminate only for other reasons? If not, and you agree that racism exists, I’m not sure what you accomplish by bringing up other groups’ struggle with discrimination. If Cubans are also discriminated against, does that mean we shouldn’t care when a black person is? As for Woody Allen — you say a lot when you say that just including a black character makes the entire story exotic or unfamiliar. Black people really do live in our everyday lives, so I’m shocked you’d feel it out of place for him to include black people in his movies set in NYC, for example. Are we not familiar with living among black people? You don’t see a person’s values when you decide to be frightened. You see their skin color and make assumptions. If you see a young black guy in a hoodie and saggy jeans, you’re going to make a judgment about him, and that’s that. If it were the differences of values that made you scared, you would be afraid until you had a conversation with the person and could determine what those values were. You assume the values based on skin color. And as a black woman, I can tell you that it’s tedious to be on the end of that experience. I like sushi, but can’t go into a sushi bar without the patrons and owners having that flash of “Oh oh, black people! Are they lost? Here to rob us?” No, I’m here to eat. People should realize that color doesn’t define anyone. Take a look at the young black man who was accepted into every Ivy League college in this country, and aced his SATs. OMG, he is “terrifying” with his dredlocks!!! And he has to carry around the paper that shows his perfect SAT scores because he doesn’t look smart. No one would dare fact check a young white man who said the same. And reverse discrimination? *eyeroll* That there have to be LAWS so that everyone gets an equal shot is not discrimination. It’s called leveling the playing field. Your first sentence says it ALL. I really value your points. Thanks for joining in!! Thank you for such thought provoking words. I am always amazed in the inconsistencies in opinions and bias from many Christians. Your words about trying to put your beliefs into your behavior and approach to others is very commendable and I appreciate you sharing! Thanks Nona. I appreciate that you made the point that this is a Christian issue. I 100% agree. I honestly don’t know how people of color are continuing in white-dominated local churches where the silence on this issue is deafening. I have had great difficulty finding coconut extract, even online and on well-known suppliers of good baking ingredients. All I seem to be able to find is imitation coconut flavoring, which really does have an artificial taste. Can you please direct me to where you obtained it, or if in fact, it is the imitation flavoring you are using? Hey Petrea! Mine actually is imitation. I find it works well for this recipe! Oh, and this is such a lovely idea for a cake. I may try it. Thanks for sharing! And for the thought provoking discussion. My point is that we are not the enemy, at least I’m not, but people are being shot every day. The USA has become a war zone. The real discussion needs to be gun control and gun responsibility, not the have and have nots. I do not own a gun at the current time, so that makes me a have not, and not privileged in this scenario, which I would like to keep it that way, unless someone, any one, tries to hurt myself or my family, then all bets are off. I would blow the head off the person, whatever color, creed, or religious background, that comes into our home to do harm. Anytime an unjust killing occurs, it is an absolute tragedy and we should certainly care. I hope the officer is investigated and tried. I agree that it should be part of a national conversation on the use of force by police officers and the militarization of the police force. I hope we all continue to speak up about that. Again, caring about one injustice doesn’t mean we can’t care about others. I have no doubt that the polemicist conservative pundits you have mentioned tried to establish that false dichotomy. Michael Brown’s killing ties into a pattern of shootings of unarmed black men and subsequent public support for their murderers, however. That significant fact shows how dangerous and hostile our society still is for people of color, and it also deserves to receive national attention. I love your blog. It’s a shame you decided to go political…and preachy. It’s bad enough my child gets brain-washed with these ideas in public school…which are ridiculous–and we have to correct. Life’s about choices, no matter what color of skin or economic level a kids born into. There are people of color (all races) that have come from poor families, but the parents worked hard, taught their children a work ethic, values..faith, managed to feed, clothe and skip the welfare line, and substance-abuse…and the children are magnificent, with every bit the opportunities you had. Maybe even more because they often are eligible for scholarships you can’t get if you’re white….affirmative action has gotten the country where we are today, because we no longer judge a man by his character, or hard work…but BY the color if his skin. America used to be about equal opportunity for everyone before the liberal-socialist agenda hijacked it, and started trashing the constitution. If you are white today, you’re not privileged…you’re not judged on character, hard work..or if you’re best for the job…because of the affirmative action rules…you’ll be overlooked (even if you’re most qualified), if they haven’t met they’re minority quotas. You’ve bought into the liberal/political/white-guilt agenda…and are spouting it as fact. It’s not fact. I believe you’re wildly inaccurate…and I know there are people who would agree with me. Allow everyone they’re own opinion, and if this is a baking blog…don’t offend half (or more) of your followers by not respecting! The very good chance…that they simply see things 100% different than you do. Now, if you said you were privileged cuz you were blessed with terrific parents…I would agree with you. I’m sure there are many other races that could be offended by your statement too. It’s a shame you even see life through the prism of race at all…remove the skin, and we’re all the same–red. Life opportunity is what you make out of it ..not what color skin you were born with. Does racism exist? Of course it does, and always will to some extent. Was there white privilege at one time, yes…but not anymore, that was corrected a long time ago! I’m afraid the last 6 years have set back our race relations and our progress. Let’s forget about race and judge someone “by their character” a very good suggestion, from a very wise man. Agreed. Stick to baking Julie, and leave the unfortunate state of the union to those better qualified to discuss it. My ancestors were from Ireland and my Grandmother told me that they were not allowed to go into certain stores or restaurants, they couldn’t even apply for a job as a dishwasher in some places, and were called names. It isn’t only the black race that has had it rough, poor white people haven’t had it so great either. Sure the black where brought to the New World as slaves, yet that was a long time ago, and it’s is time to let go of the crutch. It was a horrific period of time for the black people, and we should forget that it happened, yet why is it still being used as an excuse for certain behavior. Did you know that millions Native Americans were killed in the name of progress for the white man? Where is the sympathy for their plight? Estimates of the pre-Columbian population vary widely, though uncontroversial studies place the figure for North, Central and South America at a combined 50 million to 100 million, with scholarly estimates of 2 million to 18 million for North America alone. It is called the American Indian Holocaust. It’s Julie’s blog, she doesn’t have to stick to baking; she’s free to write about whatever she wants. Are you “better qualified to discuss” the topic she chose? Based on your comments, no. I personally found it delightful that she decided to tease us with a coconut recipe and then expounded on race relations for the first half of this page. It’s part of what makes her blog special. Don’t like it? Don’t read it. That story is absolutely appalling. I hate that that happened. And I hate that we have to continue sharing story after story and the problem continues to be invalidated by people who don’t experience it and prefer to believe it doesn’t exist. I feel like the more someone thrashes against the reality of racism and inequity in America, the more it paradoxically reveals their own underlying racial fear. Seriously, why else would you battle to prove white people have it just as hard or are just as discriminated against, when that’s obviously (generally) absurd? Why the extreme defensiveness? I wish people could lay it down and breathe and realize that it doesn’t have to be threatening to acknowledge privilege, it doesn’t have to produce any personal guilt — it can just facilitate greater empathy and harmony in our society. I haven’t seen the article you mentioned, but I’m anxious to give it a read. Thanks for sharing. Barbara, telling someone in a civil discussion to, “stick to baking” or, “leave the unfortunate state of the union to those better qualified to discuss it” is rude, patronizing, and condescending. This is my space, and I don’t have to stick to anything — this is where I share my voice. Please respect that. I will always, always, always stick to respectful discussion (and correct myself if I err), so I require that in my comment section as well. I’d also value if you didn’t presume call me unqualified, since I’m not sure how you could know my qualifications! I share only what I choose here, and while it may create a feeling of friendship and familiarity, it doesn’t mean you know me personally. To assist you to know me a little better: I’m a thoughtful, well-read, conscientious citizen, a dual-major graduate from a top liberal arts school, and a passionate follower of Christ. I feel morally obligated to speak up where I feel there is injustice, and I don’t feel especially unqualified to do so — I feel at least as qualified as I think most citizens are. When you say, “It was a horrific period of time for the black people, and we shouldn’t forget that it happened, yet why is it still being used as an excuse for certain behavior,” you ignore systemic racism and seem to think the only offense to black people is slavery itself. I encourage you to read more about the daily experiences of black people and how they might differ from yours. Have you ever been asked to leave a restaurant because people felt threatened by your presence? http://www.usatoday.com/story/news/nation/2013/08/26/south-carolina-charleston-wild-wing-cafe-black-americans/2704125/ This is just one of many, many stories. See Lisa’s comment in this thread for another. My friends at church have each been able to share one of their own. This is just the handful of people I’ve interacted with about this issue recently! Imagine the hundreds of stories of a vastly different daily experience. I also can’t see how anyone other than the officer’s supporters are making any excuses in the Michael Brown case, so I’m not sure how your assertion relates to that at all. Speaking of the Native Americans, that is another issue dear to my heart, and there are certainly areas to speak up about it right now, what with cultural appropriation and the blatant use of racist slurs against them. I regularly concern myself and speak up about that. I’m just curious why you bring it up? It seems like you’re saying that since that is occurring, I shouldn’t care about racism or an apparent murder? That seems odd to me. I can easily care about both, and do. I too noticed that false dichotomy (“if you’re so against this, why aren’t you against this?”). I see that a lot, and I find it puzzling. People can have multiple concerns about injustices and might be choosing to focus on one thing because of a recent event or what-have-you, and because frankly, sometimes it’s easier to focus on one issue at a time. People who pull the false dichotomy argument are often just trying to use another issue to detract from the one being discussed, I find. This is not because black people are lazier, didn’t work hard, didn’t have faith, etc. That is an insulting and racist insinuation. I also take exception to your implication that accepting welfare is shameful and to be avoided. This article may help: http://www.washingtonpost.com/posteverything/wp/2014/07/08/this-is-what-happened-when-i-drove-my-mercedes-to-pick-up-food-stamps/ For some reason, people generally respond with sympathy and understanding to this woman’s article, instead of the more typical judgment and disapproval. Could it be because she’s white? Something to ponder. People of color were overtly denied opportunities until around 60 years ago, and even then, racism continued to thrive. Read any discussion of race online (such as the article linked here, “The Body in the Street”) and you’ll notice it today. In a hereditary financial system (a family passes on wealth they earn), this means white families have had, on average, in general, and depending on their families’ emigration to America, centuries longer than black families to earn and pass wealth. This means at this point, black families are more likely to live in poverty-stricken neighborhoods, be constrained to poverty-stricken and educationally unequal lower-income schools. This disparity can lead to difficulty obtaining an excellent college education, finding excellent jobs, getting appropriate healthcare, etc. This does not mean plenty of white families aren’t in the same situation and facing the same struggle — it means the numbers are disproportionate because race is a factor, and the inequity is now “built in” to systems like education, healthcare, law enforcement, etc., because of the above. Individuals’ racism is still a problem, but the difficulty of leveling the playing field of society is a much bigger one, and one of the huge obstacles is helping the people who don’t suffer with the short end of the stick to SEE the disparity. It’s so easy to think it’s possible to succeed and have a comfortable life because YOU did it, but plenty of people are in a situation that is very difficult to climb out of. I could tell you story after story from my days teaching at a low-income school. The aunt who took in her abandoned nephew and nieces and worked 12-hour days every day to provide for them, but had trouble making ends meet. The kid who stole groceries from the grocery store because he was hungry, only to get arrested and have his mugshot plastered all over the internet, hurting his future opportunities. The list goes on and on. I’m sad to think you may find facile reasons to dismiss each story, though, and steel yourself not to empathize. As for, “Allow everyone they’re own opinion, and if this is a baking blog…don’t offend half (or more) of your followers by not respecting,” I would never disallow your opinion — I’m not sure how I could if I tried. But I will continue to be me. I’m terrified that there are people in this world who would not get “political” when things aren’t right for a huge segment of the population. It’s certainly not “disrespectful” to share an opinion people might not agree with. That’s an odd thing to say, in my opinion. Indeed, if it is, your comment would be disrespectful! But that’s silly. Julie, I am a long-time fan of your blog but have never commented before. This time, though, I just had to come out and voice my support: this post is wonderful and you explained privilege in a way that is both non-patronizing and easy to understand. This was a great time to come out of the woodwork, Dee, because I’m always scared to stick my neck out. I just couldn’t let discomfort stop me when people are literally fighting for the right to live. Thanks so much for your supportive comment! Seconded! I am sure it’s incredibly scary to put controversial opinions out there, but I love your writing. I find it to be extremely clear and respectful. Thanks for this post! I too struggle with those feelings of, “But I shouldn’t have to feel guilty! It’s not my fault!” I need to stop worrying about the guilt and defensiveness and instead worry about actions I can take. I’m actually one of those white people with exactly zero black friends… which really gives me pause when I think about it. I’d like to say, I value and respect what you’ve written here. It is so important for those of us with privileges in this society to recognize where we are and how we can work to make things better for people. Also yessssssssssssssss, all the coconut cakes for me. Would you put your life on the line to defend any of these people you are defending verbally? Really put your life on the line and jump in front of the cop, and take a bullet for them? Discuss what you want, whenever, and wherever, you want from the safety of your cozy little apartment. As you say it’s your blog, therefore you are the “Queen” of the hill. In my opinion, you would be hitting the dirt so fast, and wetting your pants, after the first shot was fired. I concede my participation in this discussion because it’s easy to preach how correct you are from behind a computer screen. All I’m hearing is read this or that, but you don’t say if you have been in a real situation where you have seen real prejudice, only what you have read. I am very confused by this comment also, Barbara. I’m sure I would be absolutely terrified if someone were shooting at me, of course! I hope I would try to save the person and that would be my moral imperative, but I have no idea if my bravery or rational thinking would be in sorts to do so. But for the life of me, I can’t imagine what this has to do with this discussion. May I only discuss an issue if I would consent to being shot for doing so? I’m so unclear on your point with that. I don’t know what to offer if you’re not willing to read and listen to the hundreds of stories of others’ experiences, however. Of course I don’t have any of my own — I’m white! I’m hoping you read the things I’m offering because they are educational and answer a lot of your points. If you think that is unimportant, then I’d like to gently suggest that you haven’t really been participating in a discussion — not sincerely. You’ve just been volleying the ball of an argument. There are lots of stories about horrible situations all over the world, my sympathies go to the ones left behind because of senseless acts by others. It will be interesting to find out what really happened in Missouri. I hope a swift, fair investigation, indictment, and trial make the circumstances clear, and that justice is carried out completely. Hello, I am also a longtime follower for your blog. I wanted to express my support and admiration for your post. It was very eloquent, rational and thought provoking post. I too want to share one experience of my friend. Thank you! I feel encouraged that your friend was brave enough to share that story with you, which I hope means that he has since realized some of his own implicit bias. It is so important to continually examine ourselves and also our institutions for racism. Thanks so much for sharing another story. Hi Julie! I have to admit when I’ve visited your website, I mostly scroll through the pictures and look for the recipe. I’m really glad I read through your post though. As someone who is in the midst of a career change and heading back to school this fall for social work, your words really struck a chord with me, and it’s written so eloquently. If you don’t mind, I may end up referencing this post in a future paper. Julie, I love this. Thank you for writing this. I get it. I’m Asian, FWIW–hardly immune to racism, but oddly privileged in some ways. I am aware of this, even if other people are not. I prefer to think of it as another window into human beings, though (because any other way and I would be much more jaded and cynical than I am). I just wanted to say thank you, because it’s so refreshing to read a post that’s so full of common sense and human compassion. Julie, thank you for posting this. Discussions about privilege can be frightening/uncomfortable and leave us with unsettled feelings. AND SOMETIMES THAT IS A GOOD THING. Being complacent or defensive about these events, regardless of who has shot whom, is precisely why recognizing your own privilege and being an active voice is so important. A young boy died. And lots of others will. And lots of others have. Several of my students asked me who Trayvon Martin was the other day. Trying to explain it was an emotional experience, and it was “just a news story” to relay. Then one of them asked, “Isn’t that kind of what’s happening in Missouri?” So we had a discussion about that for a few minutes. We won’t fix everything by the end of every discussion, but we will come away with a better understanding of someone who is different than us, the role we mutually play in each other’s lives, and how to also protect and respect each other. Thanks Melissa! I love that you’re providing a safe space for your students to talk about these things. It’s a hard but important conversation, and I’m glad they’re pondering it. 1. You appear to dislike the judgmental behavior of people (racism etc. ), yet you are judging all those that comment. If the commentator agrees with you, you judge them worthy. If they disagree, you judge them unworthy and feel compelled to correct them. We are all different, so allow us that difference without your righteous, condescending attitude (fancy assuming people haven’t read your “books” because that must be the only reason they don’t agree with you). 2. Case in point, so you were blessed with “white” privilege. Well I’m white and you insult me by assuming my life is a result of my “privilege,” and not my character. Your very attitude perpetrated the problem. I have overcome adversities in my life – because of my character! 3. Obviously you have never been physically threatened. Let me paint a picture for you. An unarmed man comes into your house with intent to hurt you. Are you confronted with a deadly weapon? You bet! Now you can choose to lay there and be beaten or killed, or you can choose to fight back. Now your scared. Are you going to pick up that kitchen knife to defend yourself? Are you going to use it? Does color matter right now! Only you can answer that. 4. You complain that others are defaming Brown before the facts are understood (and by inference this is happening because of his color). Yet you are doing the same, defending him because of his “underprivileged” color before you have the facts. This stuff just shits me. Practice what you preach. 5. Statistics! Are you kidding me. You being a teacher should know statistics are meaningless unless you understand the raw data behind them. So don’t use them unless you know how. Anyway, it is clear you are set in your ways. That’s fine, it’s your right, and I have the right (well good sense really) to not tune into your site anymore and put up with your righteous, preachy, condescending, full-of-yourself, racist attitude. Yes that’s right, you are the very thing you are preaching against. It’s funny how life does that to you when you’re so busy pointing fingers. You don’t see people for who they are… or what their character is… just color. You have a separate set of rules for different people based on color. The rule of law doesn’t apply to “the gentle giant” Michael Brown because he’s black? Really….? This is racism and perpetuates a dangerous cycle. Hey John! There are plenty of recipe sites — this isn’t one. This is a blog, which typically includes the personality, stories, and views of the author. I am fine with you heading to a recipe site if that’s your preference. 1. Finding someone’s argument lacking and disagreeing with them is in no way judging that person. I pride myself on civil discussion, and that’s what I’m modeling here. I’m sorry if you find my comments condescending, but I’m not sure why. For instance, I don’t know what you mean when you say, “fancy assuming people haven’t read your ‘books’ because that must be the only reason they don’t agree with you.” What books? The only time I remember mentioning someone not reading in this thread was when they explicitly said they did not want to read articles I’d posted, and I noted that it would be difficult to discuss in that case. That doesn’t feel condescending to me. Sorry you find it that way. 2. Thinking that having “privilege” means your individual life is wholly a result of that privilege rather than character is a misunderstanding of privilege. I hate that you will probably find this condescending, but I don’t know what else to say, and I don’t mean to patronize you in any way: I hope you will read the links provided on privilege (if you haven’t already), in an attempt to better understand the concept. I guess there is one other thing to say: if you think privilege is a personal insult or judgment in any way, you are unclear on the concept and would benefit from learning more about it. 3. This point is irrelevant to anything in the post, so I’m not sure why you bring it up. If you return, maybe you’ll clarify. Nothing about the Michael Brown case or privilege relates in any way to a home invasion. 4. None of the facts we currently have about the Brown case suggest any reason for the use of lethal force, and tons of other data points paint a clear picture of systemic racism affecting the way policing is executed. Nevertheless, all I (and the protestors) ask for is justice: a fair, speedy investigation, indictment, and trial. 5. I find it ironic after reading this point that you called me condescending! You are clearly trying to be nasty here, and I don’t do nastiness in my blog comments. Please keep your discussion civil. I do know “how to use” statistics, so I’m unclear what you mean. The only issue with the statistics I’ve provided here are that they show correlation and not causation, and that doesn’t seem to be what you’re talking about, so I admit, I’m not clear on your problem with the facts provided. I’m not set in my ways. I’m open-minded and ready to listen! Unfortunately, your comment doesn’t say much — it’s more about withering personal attacks than it is about discussing your views. Come back anytime you feel like really talking, and I mean that sincerely. Regarding “reverse racism,” this is a valuable read. Thanks so much for the support, Jen! I just found this post. I’m not sure which I enjoyed more, your essay or the recipe. Thank you for both. Your sentiments are even more compelling today. My sense from some of the comments posted is that there are people who do not understand how privileged a white person in the US is. That does not mean life is easy, fair, problem free, or even in the least successful. It just means that you will see people you recognize more consistently in a historical review and both explicit and implicit systems were designed for people who look like you. That makes a positive difference. Ask any women who went to medical school early in the 20th century, or the first women accepted into the military academies. I do not mean to say gender and race inequalities are the same, but there are some parallels for illustration purposes. I am looking forward to the ice box cake. Thank you again.